What is GNSS repeater-based positioning and how is it different from using pseudolites? 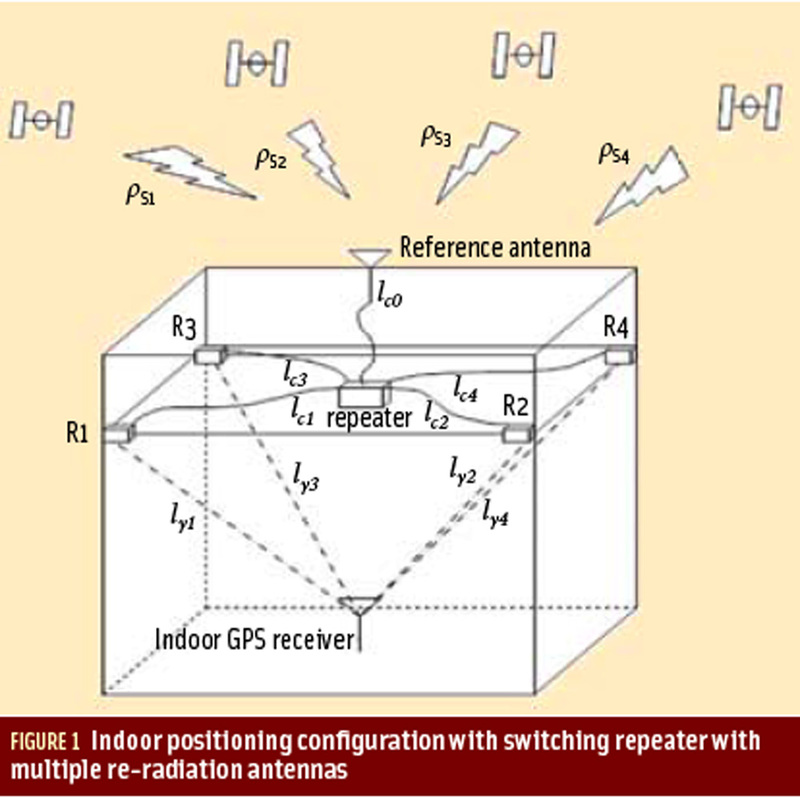 Figure 1: Indoor positioning configuration with switching repeater with multiple re-radiation antennas. Q: What is GNSS repeater-based positioning and how is it different from using pseudolites? A: A GNSS repeater is just like a cellular phone repeater that is used to boost the cell phone reception by using a reception antenna, a signal amplifier and an internal rebroadcast antenna. In contrast to cellular broadcast stations, GNSS repeaters are much smaller and often installed inside buildings with an external reception antenna collecting the satellite signals. By installing a GNSS repeater, we can receive live GNSS signals even in indoor environments. However, as is well known, the indoor position solution determined with a GNSS receiver using a repeater signal is actually the location of the outdoor reception antenna because the GNSS repeater acts like a cable connecting outdoor antenna and indoor receiver. Therefore, the extra path delay (through the repeater) is common to all satellites in view, and is thus indistinguishable from the receiver clock offset. In this case, then, how can we determine user position using GNSS repeaters? The basic idea underlying the use of repeaters is to simplify the need for additional infrastructure by using real GNSS signals. In particular, outdoor GNSS signals are amplified, switched, and/or delayed in order to be able to compute a position indoors. Pseudolites, in contrast, have their own pseudo-noise (PN) codes similar to those transmitted by the GNSS satellites. The key to using a GNSS repeater for positioning is a radio frequency (RF) switching device. This device takes a single input (i.e., the live signals from outdoors) and switches it among multiple re-radiation antennas, one at a time. By means of this time domain multiplexing, receivers can sequentially track GNSS signals from the multiple re-radiation antennas installed at different locations without self-interference. With this switching among the re-radiation antennas a change occurs in the signal retransmission path. The change corresponds to the time difference of arrival (TDOA) between the switched retransmission antennas and the user. Therefore, if we have four retransmission antennas connected to the switching repeater, we can obtain three TDOA measurements for three-dimensional positioning, as shown in Figure 1 (above right).
. . . The key to using a GNSS repeater for positioning is a radio frequency (RF) switching device. This device takes a single input (i.e., the live signals from outdoors) and switches it among multiple re-radiation antennas, one at a time.
. . . The problem of indoor repeater-based positioning thus consists of measuring the TDOA and the main technical issues are to detect and measure these code phase jumps at the time of signal switching. The problem of detecting and measuring a jump is often solved by maximum likelihood estimation . . .
Alternatively, if the switching devices are synchronized to GNSS time and the switching sequence is pre-defined, one can detect the jumps much more easily . . .
. . . The basic idea of time-delayed repeater-based positioning involves use of the orthogonal property of direct sequence spread spectrum (DSSS) signals. For example, if two different re-radiation antennas with relative RF delays (intentionally induced) of more than two chips are placed in different spatial positions and continuously retransmit the common signal, the two different signals will not interfere with each other because of the orthogonal property of DSSS signals . . . If the use of GNSS repeater is allowed for certain indoor environments under RF radiation regulations, switching and/or delaying GNSS signals enables indoor positioning, without any new PN code and signal generator as with pseudolites. The positioning accuracy that can be achieved by this repeater-based positioning is reported at about 1–10 meters depending on the system configuration and indoor multipath environment.